Jean François Bruel, Executive Chef at Daniel in New York City, shares his career timeline and advice for up-and-coming talent. Knowledge about technique, consistency and taking responsibility for their stations are three of the key lessons I teach my team daily. This helps them keep each other accountable and coach their peers. When we hire a young chef, I look for their motivation and learning potential. You can teach anyone the skills and technique, but you cannot teach someone dedication and passion. Be a good team player, share your knowledge with your peers. Be patient; you need to go through the steps to learn every station in order to continue your career growth. 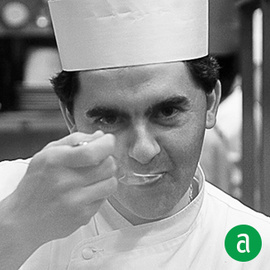 Michel Guérard taught me the simplicity of cooking. He always looked for what was essential in his cuisine and then removed anything not really consequent to the recipe, which made the dishes lighter and let the ingredients be the focus. When I was in culinary school, I learnt a lot about cooking using different techniques but not what life as a chef would be like. While in school, I worked with George Blanc and at that moment, I understood what it takes to work in a fine dining. I was introduced to many new products that I was not familiar with. It was my first time using truffles! My time there was a true journey of discovery. Haeberlin was my first reality check. It was very challenging and a very busy restaurant. I learnt so much there while working my way through different stations. I got better, faster, and gained more focus. The team spirit was amazing and it truly helped me become the chef I am today.